Do you know, you can grow some certain types of crops throughout the year? Not only that, you can do this comfortably at suitable indoor location rather than any stifling sunny location. Well if you don’t, let us tell you that the advancement in LED lighting technology has made it possible. This advancement is termed as LED Grow Lights. Grow lights are specially developed for growing plants. At first, they were only limited to large industrial applications but now they are also available for public use at an affordable price. 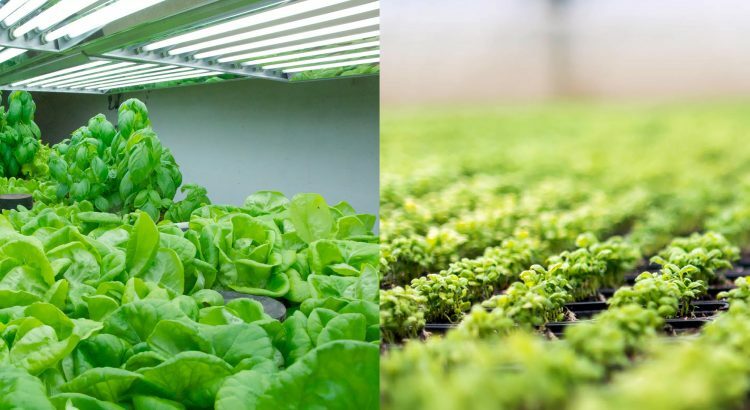 These fixtures allow you to establish indoor farming station, delivering the brightness like sunlight all over the year even in the foggy weather. All it takes is an easy plug-n-play installation. Let’s know more about what these lights are and what they have to offer. The lighting fixtures which are developed to deliver a certain type of color temperature spectrum in which plants comfortably grow are called grow lighting fixtures. This spectrum of colors produces same brightness as sunlight to which plants have the most positive response. The basic types of colors are red and blue at its simplest form. The advanced color spectrum more is focused on emitting a relaxing shade of purple color. The purple color light has a positive effect on the plants as it helps them in growing fast and strong, provides the necessary nutritious elements in an indoor area where sunlight never reaches. When going to the higher level, these advanced lights emit red, far red, blue and white combined wavelengths. This is a standard enhanced formula for many kinds of plants. Initially, the high end HID lights were the first and only choice for indoor plantation. LED’s were just about a gag in the name of indoor farming. But the continuous innovation in the Light Emitting Diode technology has brought LEDs to the front panel. Now, these lights have become the prime choice for this task. LED lighting is the king of light when it comes to the efficiency of highest lumens. These fixtures only use a little amount of electricity and give efficient brightness output. A standard halogen light will deliver 100 lumens per watt at max while an LED fixture can deliver up to 250 lumens per watt depending on the type of luminaires you select. Hence, these lights save you up to 50% extra on the electric bill for growing applications. Using this system is good for your wallet as well as the quality of production. Before the invention of grow lights, the process of farming and gardening were dependant on the type of weather. There were limited types of corps were possible to grow in a certain season. The factors like the type of sunlight, amount of water plus the certain type of soils were very important. Farmers were bound to select an appropriate place according to the season. Now say goodbye to all those problems and enjoy your own indoor farm or greenhouse. Bring some seeds and plant them at an indoor covered area for farming in the illumination of LED Grow lights and reap what you sow without any external interruption.